Like I did last year, I'm going to spend the month of October participating in 31 days of change being hosted by the Nester blog. My topic for this October? 31 letters to the twin mom I have been over the last 31 months. It's a reflection of the good, the bad and the "what the...?" Mom of 15 month old twins - Keep calm eh?! 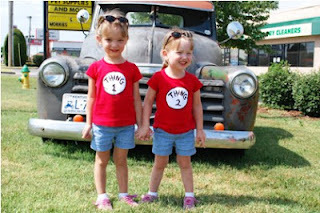 Mom of 18 month old twins - Are you smarter? The numbers actually work out perfectly! The girls will be 23 months in October and 2 years old in November. I think I am transitioning into a new parenting era and this series will give me an opportunity to reflect on the era ending. Hope you stick around to enjoy; I'm having fun writing it! These two smiling faces are the ones that come to my mind when I think of where I want to take my girls behaviour-wise in a year's time. Their mommy in my opinion is a great example of the balance I am trying to achieve with Sugar and Spice when it comes to discipline. Her style is firm but not stiffling. Her girls are lively AND well-behaved. I was tickled pink when MandyE agreed to share her discipline tips in this guest post. Read, enjoy and be blessed! When Olusola asked me to write on the topic of discipline, I was at once honored and scared. While I think our 3 ½-year old twin girls are generally well-behaved, I feel like a pretty far cry from an expert on the art of discipline. I’m here to share a few of the overarching tenets of what has worked for us over the past couple of years. I don’t know that there are any “answers” here, but I hope it might spur some dialogue. The only thing I’m certain of is that there’s no one right answer, and we can all learn at least a little something from each other. I read this somewhere when our girls were much smaller, that children respond better to a phrase such as, “Hands off!” versus “Don’t touch!” It sometimes requires some thinking in how to phrase something more positively, but I think it makes sense. I’m telling my girls what they can / should do, instead of what they can’t do. It certainly makes for a more positive atmosphere at our house, and I think that’s good for all our psyches. Further, I try to reserve saying “NO!” for situations in which it really matters, like when someone is in danger. I like to think that, since the girls don’t often hear that command, it makes much more of an immediate impression. In keeping with the positive lexicon, I try to give my girls choices when I can…choices that all result in my desired outcome, of course. My favorite example is, instead of saying, “Don’t stand on the sofa,” I tell the girls, “Get your bottom on the seat or your feet on the carpet.” Either is a win. 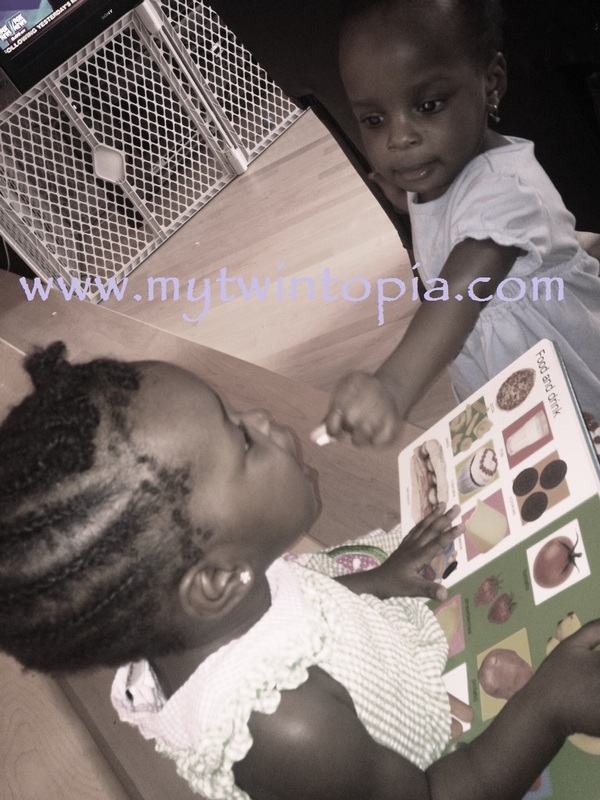 Since our girls were infants, we’ve adhered to a daily schedule for meals, naps, and bedtime. Given that, I can project when our girls will be more attentive, and when they’re more likely to fidget and not follow directions. It’s not always convenient with what I want to do, but I don’t take my girls out when they’re hungry or tired. If naptime is approaching, it’s not fair of me to expect them to behave as they would mid-morning, when they’ve just had a reenergizing snack. Likewise, I’m not going to take my girls browsing for fine china by myself. There are too many temptations, and a small misstep (which is going to happen occasionally!) could have huge ramifications. Finally, I go back to the idea of options. For example, I don’t think it’s realistic to expect a child to go into a store and literally not touch one single thing. I tell the girls that they can touch things with one finger. “One finger, please!” I’ll remind them as they start to reach for something bright and shiny. That gives them a little bit of autonomy…but – excepting a china shop – touching most things at Target or the grocery store with one finger is generally pretty harmless. 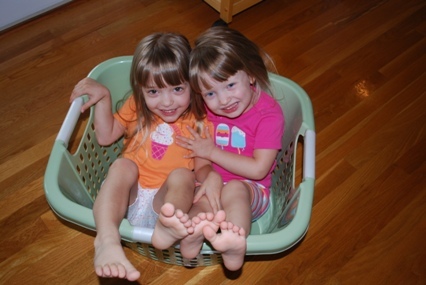 When the girls were small, I spent a lot of time distracting them from undesirable behavior. I can’t remember the exact moment in time, but at some point – maybe 18 months or so? – consequences-based discipline began to make sense. If our girls threw a toy, that toy was put into “time out” for a period of time. If our girls took their shoes off in the back of the car, they had to be carried into the restaurant instead of being allowed to walk. I first tried using time-outs when our girls were about two, but it seemed like a huge game to them. They were much closer to three when they started to dislike time out…and I silently threw a little party! After consulting with a handful of more experiences mamas, I decided to employ the “1-2-3 Magic” approach, by which a child get two reminders for minor infractions before she’s put into time out. A big tenet of this methodology is that the adult is to maintain her cool, counting infractions without emotion. I repeat to myself so often, “Never let ‘em see you sweat.” This is meant to reinforce to the child that it’s her actions that are resulting in the consequences. And I think it helps avoid children seeking attention – especially negative attention. If our girls try to demand more milk, their words will be met with a certain raised eyebrow, or perhaps a blank stare. They are quickly (and silently) reminded to reword their request. And…especially thinking about those tantrums that can be indicative of the two’s and three’s (and beyond??? )…the crying doesn’t phase me. Of course it does sometimes phase me, at which point you’ll find me repeating, “Never let ‘em see you sweat…I do not respond to terrorism…this, too, shall pass…bedtime will be here in three more hours.” J I’m mostly kidding, though. At least to date, when our girls see that they won’t get their way with tears, they snap out of it pretty quickly. Kids are kids. I sometimes have to remind myself that my three-year old may be able to recite the Pledge of Allegiance, but she’s still only three...still largely motivated by what she wants, when she wants it. It’s my job to help her shape her actions, but it’s all relative. Wow…I didn’t plan to write a book of my own here! If you’re still with me, thank you for reading. At the end of the day, we are all finding our way through raising our children. Every child is different, and we often have to work to figure out what works with each of our kiddos. I’d love to hear your thoughts on these topline points. What’s worked at your house? Now THOSE are what I consider simple and achievable tips that can actually set a parent of twins (and singleton) toddlers up for success. Do me a favor please, stop by Mandy's blog and tell her "Thank You" for me. In my ongoing pursuit of discipline tips for toddlers, I went to the library to borrow The Happiest Toddler on the Block. Unfortunately, it was out on loan so I borrowed The No-Cry Discipline Solution by Elizabeth Pantley. This is a review of the book. Contents: The book is divided into 4 sections. The first section deals with the parentin attitudes essential for No-Cry Discipline. The second section deals with parenting skills and tools. The third section deals with staying calm and avoiding anger. In the last section, the author shares tips for specific situations. My Review: I found the third section to be the most useful because it encourages a parent to dissociate their perception of a child's misbehaviour from the child's actual thoughts. In other words, a misbehaving child is not an indictment of failure on a parent. Apart from this section, I found it hard to relate to or accept the advice this book was advocating. Most of the suggested skills and tools in section 2 just didn't click with me and I found only a few of the tips in section 4 applicable for my unique situation as a mother trying to discipline toddler twins. Look at you! Type A mom with plans of potty training your twins with a wand and a snap of your fingers all within the confines of the bathroom. I remember the look of horror on your face; the first time you saw a blogger post a photo of a potty that was not positioned in the toilet. All those germs free to roam the family living spaces and let's not forget the "sweet" smell of pooped-by-a-now-eating-solids-toddler. Don't scoff! 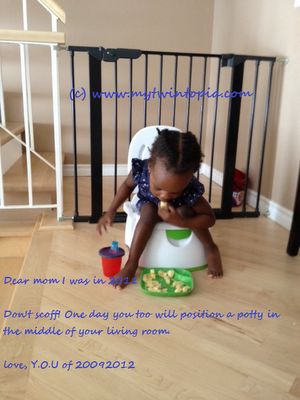 One day you too will position a potty in the middle of your living room. And you will throw away the spoon that somehow found its way into the potty. Look how far you've come, old me. I hope you've humbly learnt your lesson. This is a board book with actual and realistic photos of animals, food, clothes, toys etc. All in all, there are 216 photos (yes, I was OCD enough to count.) The twins love this because as their vocabulary increases, they are able to recognize a lot of things and ask me to name them in the book. I'm quite proud of the fact that Spice recognizes and can name most of the items on the food and drink page as well as the animals. I originally bought this book when the girls were going through their "duck" phase. They loved ducks and could "quack" for minutes on end. This is actually a book of action nursery rhymes and on each page, there are sketches of a monkey demonstrating the hand motions for the rhyme. Well would you know it, a few nights ago I saw that Sugar would turn the page and imitate the hand actions of the monkeys illustrated. Her ability to translate a picture in a book into motion amazes me and makes me really respect the kid-smartness behind this book. 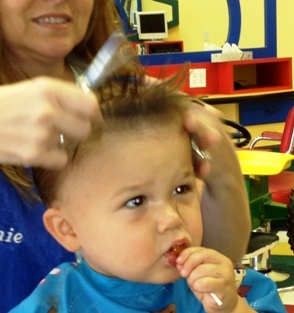 The shears are close to his ears and I can see his chin start to quiver. He looks at me like, "Don't do it mom. Don't let this lady cut my ears off. I'm so young. Save me." The woman in her apron looks at me as he screams and throws his head forward and back and says, "I can't cut his hair unless he calms down. Can I give him a sucker?" I look at him, crying and clearly being scarred as we speak. We have a family gathering! He can't go looking like Cousin It. I look at my two girls, at my feet, on the verge of pulling down the whole dvd rack or even worse, making a run for it. It was like the record stopped and the spotlight was on me. It is one of those mothering moments of truth. What choice will she make? Stick to her guns about no candy this young or give in and get the dang haircut...and give him the dumb dum-dum? Well, let's just say, he got a hair cut and kept both of his ears. The girls watched the trimming episode with no attempts to escape. All was right in the world for eight minutes. And all was even alright after the eight minutes...the eight minutes of sticky sucking, licking and eventually chewing of those little suckers. No one turned into a pumpkin, my parenting license was not revoked and they have never even once uttered the word, or a resemblance to, suckers. They had a sucker at nineteen months and it wasn't so bad. I still struggle with giving my kids items like animal crackers, cookies, cupcakes or candy because I know there is NO nutritional value in those cavity inducing items. It kills me because it seems like just yesterday they were tiny, innocent and un-touched by the world of sugar and filth...happily sucking away at their bottle and pleased with the occasional spoonful of sweet potato mash. But they are kids. They aren't little versions of me that I get to give a chance of "doing that sweet tooth over." They are wide eyed, happy and curious little people that deserve to know the joy of food and the occasional thrill of a treat. Some of my favorite childhood memories are of my dad stirring my ice cream until it was so smooth it was like pudding. Or when my Grandpa would get out his fresh strawberries, covered in sugar like a winter snow frosting. And let us not forget summer push pops or cupcakes at birthday parties. My job as the mom is to not say "NO!!" in haste to every sucker or cupcake that comes my child's way, but to let them enjoy, and then follow up with the gentle reminder that this a treat - one to be savored and celebrated. I hope to teach my kids not only moderation, but the proper way to enjoy desserts here and there, rather than expect them every time a plate is clean. I also hope to introduce "senseless" choices once in awhile, teaching them that part of the joy of life is indulging and savoring in delicious foods, just because they taste good...especially when shared with others! My job is also to lead by example...so when that afternoon opens up and we are right next to a cupcake shop - I will go in, have a rare cupcake and make a special memory with my children. I don't have to always pass on the cupcake that makes me think twice about fitting in my favorite jeans. Together, we can indulge in a lazy afternoon over a sugary, dense cake and whipped layered frosting. However, my bet is the craving of a chocolate cupcake will come and go, while the laughs and mess we shared together over an occasional finger licking good time will linger forever. Do you lead by example with moderation? Kristin is the author and founder of justbreathemama.com - a website promoting health and emotional balance amidst the chaos and demands of motherhood. She speaks from the heart, as she tries to figure it all out while raising her toddler triplets, staying sane and savoring the gift of marriage to her husband of five years. Together they live in Indianapolis, Indiana. Apu (actually plums): Ali will take a few bites of the fleshy part of a plum and she’s done. George eats it clean to the seed. Both girls now love having bows and such on their hair. Exciting for a mom who purchased 40 plus pieces of hair doodahs over a year ago and may finally get to use them. Occasionally Ali tries to carry George and I’m thinking can a 24-pounder lift a 23-pounder? So far the answer is no! Mirroring is also a favorite pastime especially at bedtime. I put them in bed and they spend the next 10 minutes playing the wordless version of Simon-Says. 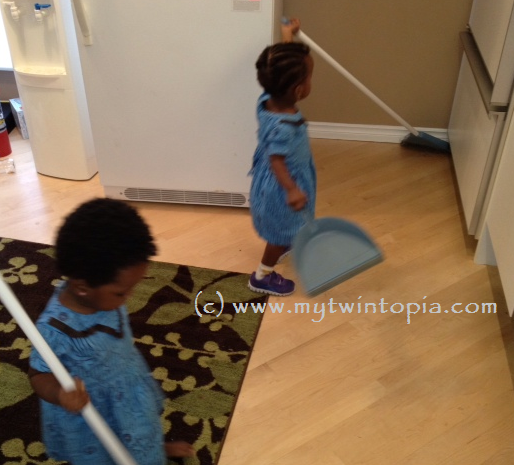 Actions include dancing, stomping, jumping and running around the crib. First use of blanket in cribs. The girls love having blankets to cover their feet. I got the SwaddleDesigns Ultimate Receiving Blanket for when they were infants but did not use it for swaddling. It’s coming in useful now because unlike the typical baby blankets that are 30 inches square, this blanket is 42 inches square and cozy to snuggle in. Clueless! Mommy’s reading discipline books and enlisting the help of two other blogger moms of multiples. I’ll be sharing their guest posts later this week. For now, here's a photo of our resident best friends. 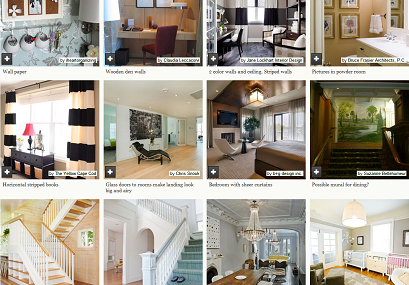 Houzz: This is an app that has millions of decor pictures. The pictures can be browsed by room, decor style or by metro area. There's also a search function - I've been doing a lot of searching for "grey walls" and "murals". One great feature is that I can save my favorite pictures in an ideabook with notes. Blogs: Lots of decor blogs out there in the blogosphere but there are very few I can relate to. On that short list are Emily Clark and Holly Mathis. These two blogs have opened my eyes to the possibilities of DIY work and finding unique pieces on craigslist. Thanks to them, I MAY consider welding a spray can of paint for some fancy furniture work. Pinterest: Would this list be complete without a mention of pinterest? I'm starting to fall out of love with Pinterest (not sure I was ever in love actually) but I still collate ideas on my Our New House board. MLS listings: I love to browse the high-end homes on our mls website. I figured out if a house is worth a million dollars, the owners probably hired an interior decorator and I can get some tips from checking out their cribs. Right now, we're in countdown mode and my heart is beating just a little faster. Anybody else decor stalking? It's been 18 months since I first got the Baby Jogger City Mini Double stroller and sang it's praises. Where do I stand today? The stroller has it's pros and cons but there's still no stroller currently in the market that I'd rather own. Let's start with the cons. Full recline seats: A really useful feature when the girls were infants with no neck support. It didn't feel too comfortable though so if I had to do it again I'll get two of those Infant Snuzzler thingies to cushion the girls. Maneuverability: The Baby Jogger City Mini Double's number one asset is that it is soooo easy to maneuver regardless of how big the kids are. My daily commute involves a 30 minute walk, 12 doorways and the occasional old elevator that will snap your limbs off if you don't move fast enough. My stroller has been an asset in making these adventures just a little easier. Did I miss something? I don't think so. 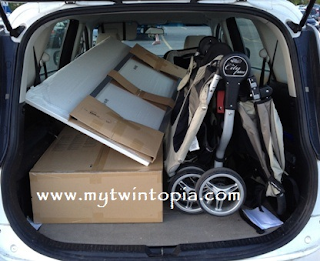 The Baby Jogger 2011 City Mini Double Stroller costs around $400 and in my opinion has been worth every penny. As in love as I sound in this post, I wasn't paid to write it. Just have to share what has been one of the better buys of my twin parenthood. I leave you with a pic of the stroller protecting the kids for what was a very smouldering San Antonio sun. Look at those cute, teeny, chunky legs. I miss those days! 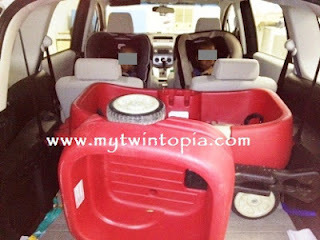 I remember the day we bought the Madza5 minivan vividly. I wasn't exactly a happy car buyer. I was swapping a sporty red Mazda3 for a white minivan. My swagger felt wounded but we bought the car anyway. It was in October of 2010 and I was already past 36 weeks pregnant so we couldn't put off buying a new twin-friendly car any longer. I'm quite satisfied with this car. It doesn't have the zoom-zoom factor of the Mazda3, but it does what it was bought to do just fine. Do share, what's your greatest hauling achievement? Mine's definitely the table and chair in the last picture. This is a fun post to link up to Ginger's Wordful Wednesday. She's potty training y'all and I'm all ears. In my last monthly update, I mentioned that the girls like to help out and I'm making a conscious effort to give them "tasks". So as part of their nightly chores, I get them to mop the floors and take out the trash! - *drumroll please* picking up their toys before bedtime. This is such a big one for me. It takes 7-10 minutes and involves me pointing at every toy in the living room and asking them to take it to their toy corner. The more we do this, the more they grasp the concept. I do need to buy some toy boxes so that they're actually putting the toys away. "Twice a month, you can see a new release 'grown-up' movie in a baby-friendly environment. We keep the lights on dim, and lower the volume so you can watch the film while caring for your little one. Each Reel Babies auditorium is equipped with a change table, bottle warmer, play mat, exersaucer and baby swing so you can attend to your baby without missing that crucial kiss, diss, or explosion"
AMC theatres have their Bring Your Baby Matinee in select theatres on the first Tuesday of every month. According to the website; brighter lights, lower volume, stroller parking and breastfeeding is accepted. Camera Cinemas is just one of the many smaller theatres in the US offering baby-friendly movies. To find one in your area, google "mommy matinee" + the name of your city. For us, I would love to take the girls to the movies at least once for the experience of it but I don't think there's a suitable opportunity available that can accomodate our current schedule. Oh well, we'll stick to reruns of the Cat in The Hat for now. If you enjoyed this post or found it useful, click here to share on Twitter . Do you remember this post? Well, here's how I solved that problem. I'm short one headband but at least now the shoes and coats stay IN the closet. Can you relate? It's amazing how many things around the house can pull double duty. "Start Registering for Preschool" That's the reminder that stared me in the face on Saturday. I had set the reminder earlier in the year that come September, I would start registering the twins for preschool. Why so early you ask? 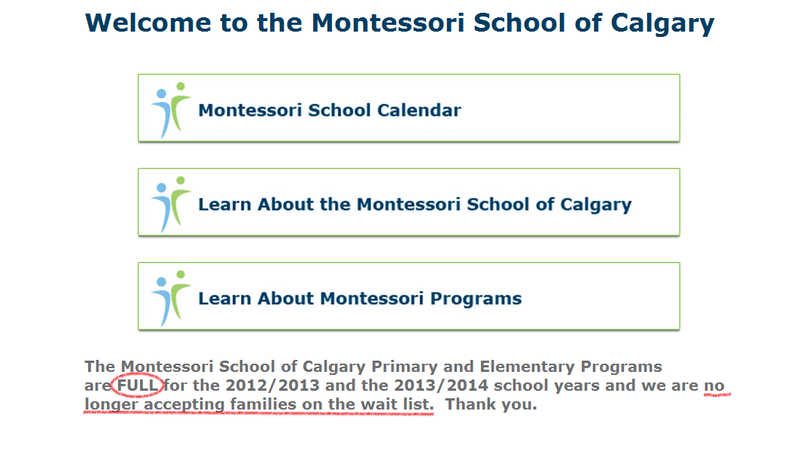 Well, turns out some preschools in Calgary have serious waitlists. I'm talking over a year here so it's not too early to start looking for a preschool that fits in with my personal circumstances. Emphasis on the word "FULL"
Location: The preschool has to be located in close proximity to my home-to-work commute route. That is what sets the boundary conditions for the preschools I will consider. 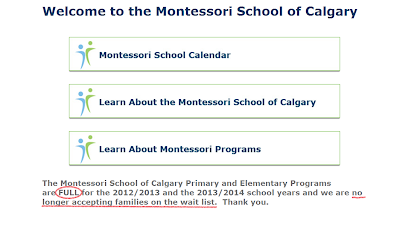 Program type: There are so many types of preschool programs in Calgary, the choice is mine to make. The programs I'm most leaning towards are the Christian ones and the Montessori ones. Very undecided on this yet. Daycare vs School environment? Our current daycare has a preschool class and so do a number of private schools in the Calgary area. The question is do we continue with the daycare until kindergarten or switch to a preschool that's part of a private school structure. Each option has it's pros and cons. I've got my work cut out and I confess that I am not looking forward to it because it's looking like a clear case of when the desirable is not available, the available becomes desirable. Ending on that proverbial note.